Q. How Do I Setup Repeat Schedule? You are here: Home / LifeTopix / Common Questions / Q. How Do I Setup Repeat Schedule? 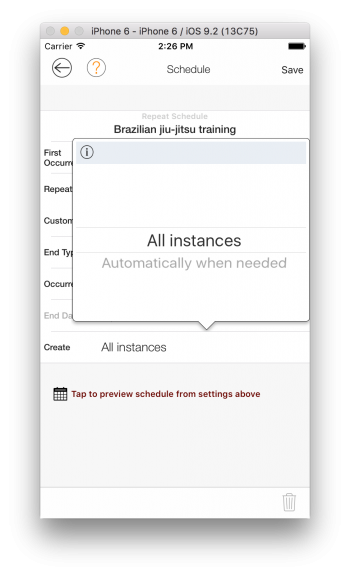 You can set repeat schedules for appointments, events, tasks, and payments in our apps. 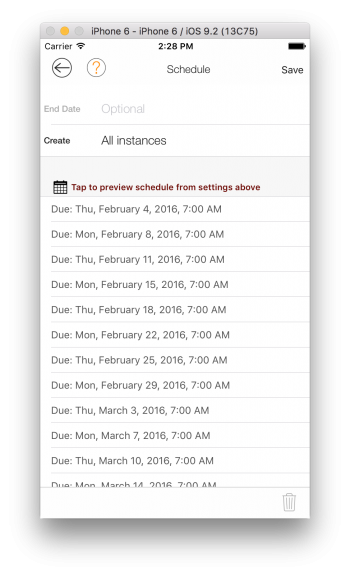 LightArrow apps include a variety of options for repeat schedules, which are described below. The following example uses Task Repeat schedule as an example. The same can be applied to events, appointments and bill payments. 1. 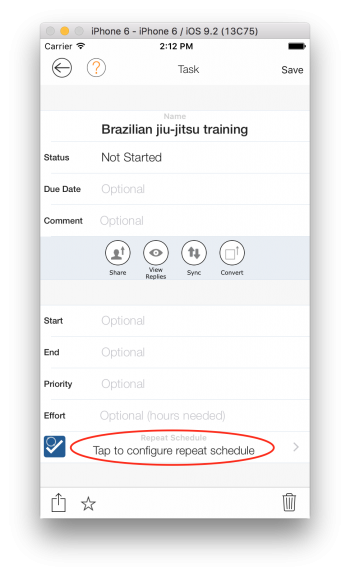 Open the Task detail view and tap on the repeat schedule button. 3. From the Repeat Every field, select days, weeks, months, or years and select a corresponding number. For example, if you want an appointment to occur every other month, select 2 and month. The options for custom schedules vary, depending on your selection. If you choose day, a custom schedule is not available from the Custom field. If you choose year, a custom schedule is not available from the Custom field. 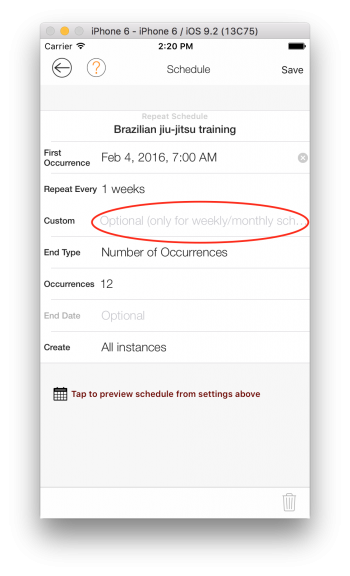 If you choose month, you can create a custom month schedule after tapping the Custom field by tapping specific days of the month. Optionally, you can also specify every first, second, third, fourth, or last day of the month (this option is available twice for more flexibility). These options are excellent for class schedules. 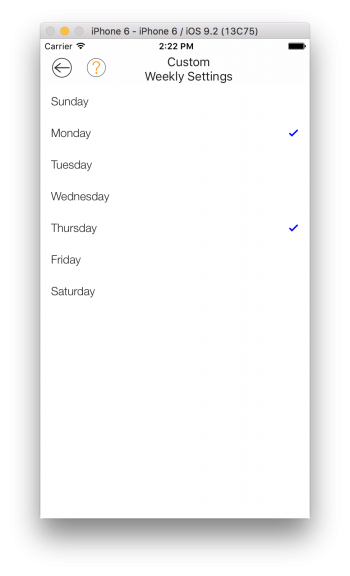 If you choose week, you can select specific days of the week after tapping the Custom field, by tapping the days that display on the Custom Month Schedule popup. 4. Choose Number of Occurrences or Until End Date for the recurring task. If you chose Until End Date, enter the end date in the End Date field. 5. Select Pre-Create or Create automatically option. This option is available for tasks only. If you don’t want a task to be created until you finish the previous task, select Automatically when needed from the Create field. Otherwise, select All Instances. 6. 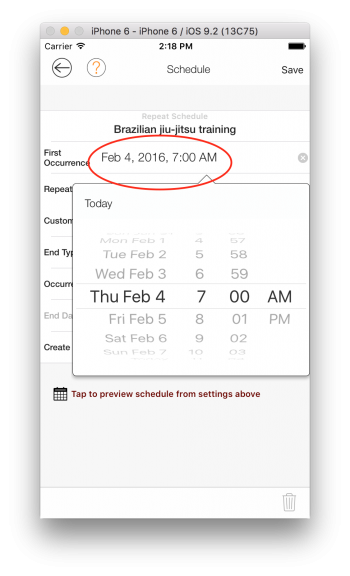 If you wish to see a preview of the schedule, tap the preview schedule option at the bottom of the view. 7. Tap on the save button above to save the task and pre-create all task instances as per the configured repeat schedule if the pre-create option is selected. If “Automatically if needed” option is selected, then the next task is created for the repeat schedule when the previous task instance is either marked completed, cancelled, or deleted.